Above image: Forrest Kirkland’s watercolor depiction of the art at Rattlesnake Canyon in the Lower Pecos is one of the dozens in TARL’s collections that have been scanned for viewing online on Texas Beyond History. In 1933, artists Forrest and Lula Kirkland began a study of the extraordinary rock art of Texas. Working chiefly on weekend camping trips, the couple’s interest developed into a mission that was to span 10 years. Their epic journeys took them across much of the state, from the mountains of the Trans Pecos, to rocky bluffs along the clear streams of the Edwards Plateau, to the rugged canyonlands of the Lower Pecos. Wherever prehistoric peoples had found a stone canvas for their expression, the Kirklands traveled to examine and document the artwork. 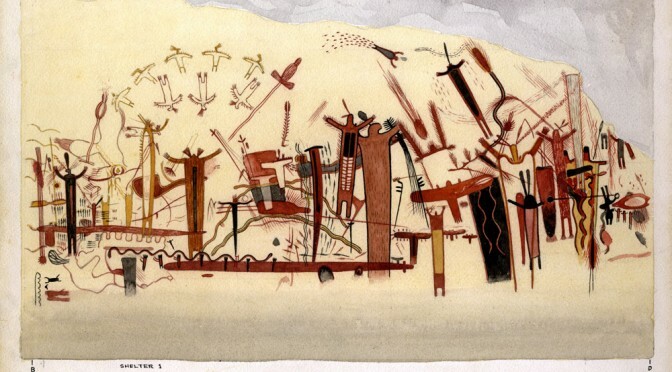 Early on, the two perfected the recording techniques that allowed them to capture the ancient pictographs and petroglyphs on canvas: Forrest carefully measured and sketched the art to scale in pencil, then adding water color to match the paintings on rock. Lula, meanwhile, drove, scouted for sites, photographed the art, and performed many camp chores. The dozens of watercolor paintings that emerged from this near-Herculean effort are preserved at TARL for researchers to examine and compare to the ancient art today. Because of the careful documentation techniques the Kirklands employed, these paintings—now over 80 years old—constitute a critical record of the ancient art and are treasures in themselves. Much of the rock art observed and painted by Forrest Kirkland has since been damaged if not destroyed by natural forces and human vandals. Small details and even whole sections of paintings copied in the Kirkland watercolors no longer exist today. The great majority of the Kirkland watercolor collection have been digitally scanned and is available for viewing on TARL’s website, Texas Beyond History, along with substantive discussion about the prehistoric and historic period painters and their cultures. Galleries of Kirkland’s renderings of the monumentally scaled Lower Pecos rock art can be viewed in detail at http://www.texasbeyondhistory.net/plateaus/artistic/trail.html; that of the surprisingly diminutive works at Hueco Tanks in the Trans Pecos can be seen at http://www.texasbeyondhistory.net/hueco/gallery.html. Further discussion is provided in a section on artistic expression of the Trans Pecos: http://www.texasbeyondhistory.net/trans-p/artistic/index.html and Lower Pecos http://www.texasbeyondhistory.net/plateaus/artistic/index.html. Spanning at least 4,500 years, Texas’ ancient rock art paintings are a window into the spiritual beliefs and cultural traditions of the past. At the other end of the spectrum, we can view through native artist’s eyes the coming of early Spanish explorers and priest and mull the cultural upheaval that lay in store at that long ago time. 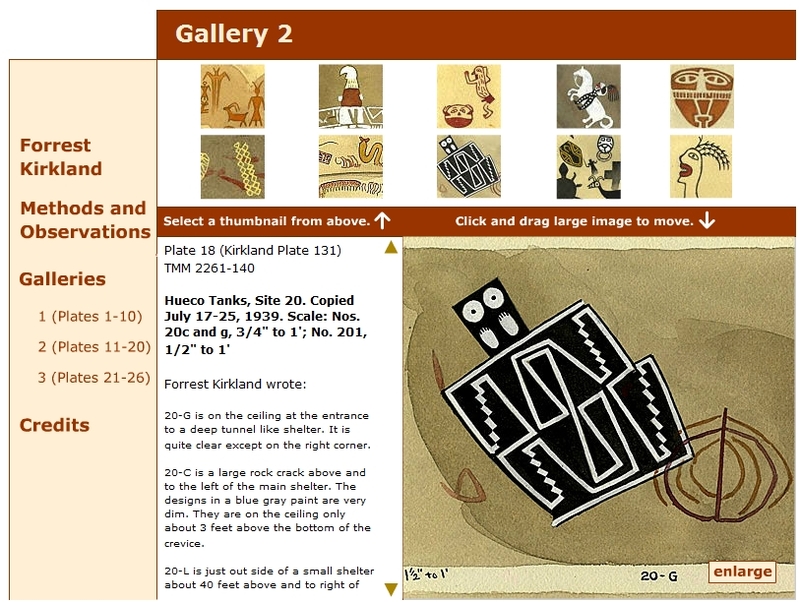 Online galleries on Texas Beyond History enable viewers to view small details of Kirkland’s watercolor paintings, such as the tiny mask paintings at Hueco Tanks in the Trans Pecos region. Kirkland’s rendering of the 100-foot long panel at Myers Springs in far western Terrell County includes numerous details which have since been obliterated. The paintings include expressions in early Pecos River style to depictions at the time of contact with Europeans. From The Rock Art of Texas Indians by Forrest Kirkland and W. W. Newcomb, Jr. (University of Texas Press, reprinted edition 1999). 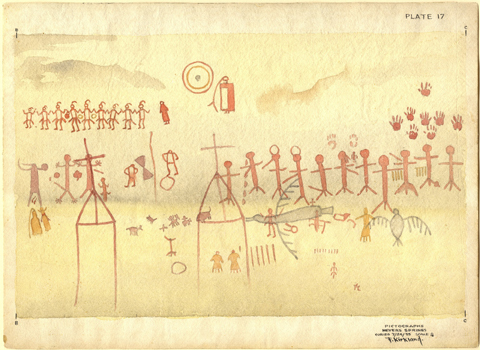 Kirkland’s painting at the head of the article is by far the most intriguing example North American rock art I have seen to date. Has anyone attempted an interpretation of its symbolism? How can a person get permission to use Kirkland’s images found on Texas Beyond History website? I have a significant portfolio of photographs of many of the pictographs at Paint Rock and throughout the Lower Pecos that Kirkland copied. I’d like to publish my photos alongside Kirkland’s copies to show how they look 70 some odd years later. Hi Chester, If you’d like to look into obtaining high-resolution versions of the images on Texas Beyond History, you should use our official Request for Photography/ Scans/ Copies form, available HERE. Any images to be used in any anticipated for profit publication will be assessed a fee. In this case, the fee would probably include staff time to find and scan the images (we likely only have the low-resolution versions used on Texas Beyond History) as well as a per-image fee. Thanks! Yes you may, thank you for your interest!